This course really should be entitled the ‘Diversity & Ecology of the Tetrapods‘ as we focus exclusively on the amphibians, reptiles, birds and mammals (our students cover the fish in a different course). But, for some reason, this title seems to have stuck. This is our department’s introductory course to wildlife, including natural history and identification. In the lectures I provide a brief overview of tetrapod anatomy and physiology, and then we go into coverage of the four tetrapod groups. This includes taxonomy and evolutionary relationships, (Darwin, anyone?) and an introduction to the amazing array of adaptations that these animals show. I also cover some of the fundamental concepts in animal ecology that the students will deal with in detail later on. We occasionally interrupt the normal lecture schedule for gala events like the ‘Critter Competition’ and the ‘Very Best Tetrapod Day’. In the labs, Sheri Watson works with the students to hone their field skills in animal identification, using tools such as field guides, songs and calls, shed skins (snakes!) and tracks. All in all, this is a fun course to teach, and at the same time, it helps the students to build a broad appreciation of the different tetrapod groups. 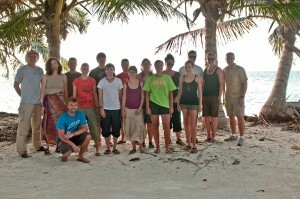 I teach two upper-level ‘sibling’ courses in wildlife management and conservation. NRSC 4040 provides the students with a grounding in the major scientific concepts in the field, and in doing so, allows them to move further into the field of application and management within a social, human context (see NRSC 4050 below). Topics we cover in this course include island biogeography, metapopulation theory, reserve design, population viability analysis, principles of wildlife genetics, invasive species, fragmentation, wildlife habitat analyses, and the demography and extinction risk of small populations. 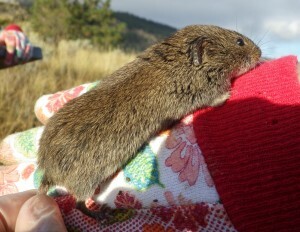 In this course, we also conduct a small mammal trapping survey within the grasslands surrounding Kamloops. As Sheri Watson (the lab instructor) and I started this project back in 1997, we now have a long-term data set that undergraduates in this course learn how to use for basic population and demographic analyses. NRSC 4050 – Wildlife Conservation & Management II: Practice & Application. This is the ‘sister course’ to NRSC 4040 described above. This course builds upon the theory and principles presented in 4040, by providing students with an increased understanding of the application of scientific principles to the conservation of wildlife. The course also includes more focus on the philosophy and human dimensions of wildlife conservation and management, particularly the need to balance multiple values in developing sustainable management planning. The course includes the analysis and discussion of case studies, both locally and globally, and a number of guest lectures are delivered by professional in the field of wildlife management. The formal descriptions for this course and NRSC 4040 appear in the TRU calendar, which you can access off the main TRU homepage.